John Cheever (May 27, 1912 – June 18, 1982) was an American novelist and short story writer, sometimes called "the Chekhov of the suburbs." His fiction is mostly set in the Upper East Side of Manhattan, the Westchester suburbs, and old New England villages based on various South Shore towns around Quincy, Massachusetts, where he was born. Cheever is perhaps best remembered for his short stories (including "The Enormous Radio," "Goodbye, My Brother," "The Five-Forty-Eight," "The Country Husband," and "The Swimmer"), but also wrote a number of novels, such as The Wapshot Chronicle (National Book Award, 1958), The Wapshot Scandal (William Dean Howells Medal, 1965), Bullet Park, and Falconer. Cheever's main themes include the duality of human nature: Sometimes dramatized as the disparity between a character's decorous social persona and inner corruption, and sometimes as a conflict between two characters (often brothers) who embody the salient aspects of both light and dark, flesh and spirit. Many of his works also express a nostalgia for a vanishing way of life (as evoked by the mythical St. Botolphs in the Wapshot novels), characterized by abiding cultural traditions and a profound sense of community, as opposed to the alienating nomadism of modern suburbia. John William Cheever was the second child of Frederick Lincoln Cheever and Mary Liley Cheever. His father was a prosperous shoe salesman, and Cheever spent much of his childhood in a large Victorian house in the genteel suburb of Wollaston, MA. In the mid-twenties, however, as the New England shoe and textile industries began their long decline, Frederick Cheever lost most of his money and began to drink heavily. To pay the bills, Mary Cheever opened a gift shop in downtown Quincy–an "abysmal humiliation" for the family, as her son John saw it. In 1926, Cheever began attending Thayer Academy, a private day school, but he found the atmosphere stifling and performed poorly, finally transferring to Quincy High in 1928. A year later he won a short story contest sponsored by the Boston Herald, and was invited back to Thayer as a "special student" on academic probation. His grades continued to be poor, however, and in March 1930 he was either expelled for smoking or (more likely) departed of his own accord when the headmaster delivered an ultimatum to the effect that he must either apply himself or leave. The eighteen-year-old Cheever wrote a sardonic account of this experience, "Expelled," which was subsequently published in The New Republic. Around this time, Cheever's older brother Fred—recalled from Dartmouth in 1926 because of the family's financial crisis—reentered his life "when the situation was most painful and critical," as John later wrote. After the bankruptcy (in 1932) of Kreuger and Toll International Match, in which Frederick Cheever had invested what was left of his money, the Cheever house on Winthrop Avenue was lost to foreclosure. The parents separated, while John and Fred took an apartment together on Beacon Hill in Boston. In 1933, John wrote to Elizabeth Ames, the director of the Yaddo artist's colony in Saratoga Springs, New York: "The idea of leaving the city," he said, "has never been so distant or desirable." Ames denied his first application, but offered him a place the following year; Cheever decided to sever his "ungainly attachment" to his brother. (Passages in Cheever's journal suggest—without stating conclusively—that his relationship with Fred may have been sexual.) Cheever spent the summer of 1934 at Yaddo, which would serve as a second home for much of his life. For the next few years, Cheever divided his time between Manhattan, Saratoga, Lake George (where he was caretaker of the Yaddo-owned Triuna Island), and Quincy, where he continued to visit his parents, who had reconciled and moved to an apartment at 60 Spear Street. Cheever drove from one place to another in a dilapidated Model A roadster, but had no permanent address. In 1935, Katharine White of The New Yorker bought Cheever's story, "Buffalo," for $45—the first of many that Cheever would publish in the magazine. In 1938 he began work for the Federal Writers' Project in Washington, D.C., which he considered an embarrassing boondoggle. As an editor for the WPA Guide to New York City, Cheever was charged with (as he put it) "twisting into order the sentences written by some incredibly lazy bastards." He quit after less than a year, and a few months later he met his future wife, Mary Winternitz, daughter of Milton Winternitz, dean of Yale Medical School, and granddaughter of Thomas A. Watson, an assistant to Alexander Graham Bell during the invention of the telephone. The couple were married in 1941. Cheever enlisted in the Army on May 7, 1942, and his first collection, The Way Some People Live, was published the following year to mixed reviews. Cheever himself came to despise the book as "embarrassingly immature," and for the rest of his life endeavored to destroy every copy he could lay his hands on. The book arguably saved his life, however, when it fell into the hands of Major Leonard Spigelgass, an MGM executive and officer in the Army Signal Corps, who was struck by Cheever's "childlike sense of wonder." Early that summer, Cheever was transferred to the former Paramount studio in Astoria, Queens, where he commuted via subway from his apartment in Chelsea: Meanwhile, most of his old infantry company was killed on Normandy Beach during the D-Day invasion. Cheever's daughter Susan was born on July 31, 1943. After the war, Cheever moved his family to an apartment building at 400 East Fifty-ninth Street, near Sutton Place; almost every morning for the next five years, he would dress in his only suit and take the elevator to a maid's room in the basement, where he stripped to his boxer shorts and wrote until lunchtime. In 1946, he accepted a $4,800 advance from Random House to resume work on his novel, The Holly Tree, which he had discontinued during the war. "The Enormous Radio," a Kafkaesque tale about a sinister radio that broadcasts the private conversations of tenants in a New York apartment building, appeared in the May 17, 1947, issue of The New Yorker. A startling advance on Cheever's early, more naturalistic work, the story elicited a fan letter from the magazine's irascible editor, Harold Ross: "It will turn out to be a memorable one, or I am a fish." Cheever's son, Benjamin, was born on May 4, 1948. Cheever's work became longer and more complex, apparently a protest against the "slice of life" fiction typical of The New Yorker in those years. An early draft of "The Day the Pig Fell into the Well"—a long story with elaborate Chekhovian nuances, meant to "operate something like a rondo," as Cheever wrote his friend and New Yorker editor William Maxwell—was completed in 1949, though the magazine did not make space for it until five years later. In 1951, Cheever wrote one of his finest stories, "Goodbye, My Brother," after a gloomy summer in Martha's Vineyard. Largely on the strength of these two stories (still in manuscript at the time), Cheever was awarded a Guggenheim Fellowship. On May 28, 1951, Cheever moved to "Beechwood," the suburban estate of Frank A. Vanderlip in Scarborough-on-Hudson, Westchester, where he rented a small cottage on the edge of the estate. Cheever's second collection, The Enormous Radio, was published in 1953. 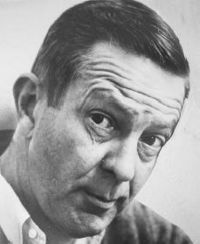 Reviews were mostly positive, though Cheever's reputation continued to suffer because of his close association with The New Yorker (considered middlebrow by many critics), and he was particularly pained by the general preference for J.D. Salinger's Nine Stories, published around the same time. Meanwhile Random House demanded that Cheever either produce a publishable novel or pay back his advance, whereupon Cheever wrote Mike Bessie at Harper & Brothers ("These old bones are up for sale"), who bought him out of his Random House contract. In the summer of 1956, Cheever finished The Wapshot Chronicle while vacationing in Friendship, Maine, and received a congratulatory telegram from William Maxwell: "WELL ROARED LION." With the proceeds from the sale of film rights to "The Housebreaker of Shady Hill," Cheever and his family spent the following year in Italy, where his son Federico was born on March 9, 1957 ("We wanted to call him Frederick," Cheever wrote, "but there is of course no K in the alphabet here and I gave up after an hour or two"). The Wapshot Scandal was published in 1964, and received perhaps the best reviews of Cheever's career up to that point (amid quibbles about the novel's episodic structure). Cheever appeared on the cover of the Time magazine's March 27 issue that carried an appreciative profile, "Ovid in Ossining." (In 1961 Cheever had moved to a stately, stone-ended Dutch Colonial farmhouse in Ossining, on the east bank of the Hudson.) "The Swimmer" appeared in the July 18 issue of The New Yorker. Cheever noted with chagrin that the story (one of his best) appeared toward the back of the issue—behind a John Updike story—since, as it happened, Maxwell and other editors at the magazine were a little bewildered by its non-New Yorkerish surrealism. In the summer of 1966, a screen adaptation of "The Swimmer," starring Burt Lancaster, was filmed in Westport, Connecticut, where Cheever was a frequent visitor on the set and did a cameo for the movie. By then, Cheever's alcoholism had become severe, exacerbated by torment concerning his bisexuality. Still, he blamed most of his marital woes on his wife, and in 1966, he consulted a psychiatrist, David C. Hays, about her hostility and "needless darkness." After a session with Mary Cheever, the psychiatrist asked to see the couple jointly; Cheever, heartened, believed his wife's difficult behavior would finally be addressed. At the joint session, however, Dr. Hays claimed (as Cheever noted in his journal) that Cheever himself was the problem: "A neurotic man, narcissistic, egocentric, friendless, and so deeply involved in [his] own defensive illusions that [he has] invented a manic-depressive wife." Cheever soon terminated therapy. Bullet Park was published in 1969, and received a devastating review from Benjamin DeMott on the front page of The New York Times Book Review: "John Cheever's short stories are and will remain lovely birds… But in the gluey atmosphere of Bullet Park no birds sing." Cheever's alcoholic depression deepened, and in May he resumed psychiatric treatment (which again proved fruitless). On May 12, 1973, Cheever awoke coughing uncontrollably, and learned at the hospital that he had almost died from pulmonary edema caused by alcoholism. After a month in the hospital, he returned home, vowing never to drink again; however, he resumed drinking in August. Despite his precarious health, he spent the Fall semester teaching (and drinking) at the Iowa Writers' Workshop, where his students included T. C. Boyle, Allan Gurganus, and Ron Hansen. As his marriage continued to deteriorate, Cheever accepted a professorship at Boston University the following year, and moved into a fourth-floor walkup apartment at 71 Bay State Road. Cheever's drinking soon became suicidal, and in March 1975, his brother Fred—now virtually indigent, but sober after his own lifelong bout with alcoholism—drove John back to Ossining. On April 9, Cheever was admitted to the Smithers Alcoholic Rehabilitation Unit in New York, where he shared a bedroom and bath with four other men. Driven home by his wife on May 7, Cheever never drank alcohol again. During a teaching junket at the University of Utah in January 1977, Cheever met a Mormon writing student named Max, who for the next five years would be an occasional companion, secretary, and (somewhat reluctantly) lover. Two months later, Cheever appeared on the cover of Newsweek magazine with the caption, "A Great American Novel: John Cheever's 'Falconer.'" The novel was Number One on the New York Times Best Seller list for three weeks. The Stories of John Cheever appeared in October 1978, and became one of the most successful collections ever, selling 125,000 copies in hardback and winning universal acclaim. In the summer of 1981, a tumor was discovered in Cheever's right kidney, and in late-November he returned to the hospital and learned that the cancer had spread to his femur, pelvis, and bladder. Cheever's last novel, Oh What a Paradise It Seems, was published in March 1982; only a hundred pages long and relatively inferior (as Cheever himself suspected), the book received respectful reviews in part because it was widely known the author was dying of cancer. On April 27 he received the National Medal for Literature at Carnegie Hall, where colleagues were shocked by Cheever's ravaged appearance after months of cancer therapy. "A page of good prose," he declared in his remarks, "remains invincible." As John Updike remembered, "All the literary acolytes assembled there fell quite silent, astonished by such faith." He died on June 18, 1982. In 1987, Cheever's widow, Mary, signed a contract with a small publisher, Academy Chicago, for the right to publish Cheever's uncollected short stories. The contract led to a long legal battle, and a book of 13 stories by the author, published in 1994. Two of Cheever's children, Susan and Benjamin, became writers. Susan Cheever's memoir, Home Before Dark (1984), revealed Cheever's bisexuality, which was confirmed by his posthumously published letters and journals. After Blake Bailey published his biography of Richard Yates, A Tragic Honesty (2003), Cheever's son Ben suggested he write an authoritative biography of Cheever. The book is scheduled to be published by Knopf in 2009. Cheever was one of the modern masters of the short story. His stories usually took their impetus from "the interrupted event, which he considered the prime source of short stories." A compilation of his short stories, The Stories of John Cheever, won the 1979 Pulitzer Prize for Fiction and the National Book Critics Circle Award. On April 27, 1982, six weeks before his death, Cheever was awarded the National Medal for Literature by the American Academy of Arts and Letters. ↑ From Cheever's unpublished journal, on deposit at Houghton Library, Harvard University. ↑ Jon [sic] Cheever, "Expelled," The New Republic, October 1, 1930: 171-174. ↑ 3.0 3.1 Benjamin Cheever (ed. ), The Letters of John Cheever (New York: Simon and Schuster, 1988). ↑ John D. Weaver (ed. ), Glad Tidings: A Friendship in Letters (New York: Harper Collins, 1993). ↑ Thomas Kunkel (ed. ), Letters from the Editor: The New Yorker's Harold Ross (New York: Modern Library, 2000). ↑ The Letters of John Cheever, 179. ↑ The Letters of John Cheever, 196. ↑ Robert Gottlieb (ed. ), The Journals of John Cheever (New York: Alfred A. Knopf, 1991), 214. ↑ Benjamin DeMott, New York Times Book Review, April 27, 1969, 1, 40-1. ↑ John Updike, Odd Jobs (New York: Alfred A. Knopf, 1991), 113. ↑ New York Times, John Cheever Is Dead At 70. Novelist Won Pulitzer Prize. Retrieved November 18, 2008. ↑ Edgar Allen Beem, Cheever's Keeper. Retrieved November 18, 2008. ↑ Merriam Webster's Encyclopedia of Literature, 232. Cheever, Benjamin (ed.). The Letters of John Cheever. New York: Simon and Schuster, 1988. ISBN 9780671628734. DeMott, Benjamin. New York Times Book Review. 1 (1969): 40-1. ISSN 0028-7806. Kunkel, Thomas (ed.). Letters from the Editor: The New Yorker's Harold Ross. New York: Modern Library, 2000. ISSN 0028-7806. Updike, John. Odd Jobs. New York: Alfred A. Knopf, 1991. ISBN 9780679404149. Weaver, John D. (ed.). Glad Tidings: A Friendship in Letters. New York: Harper Collins, 1993. ISBN 9780060169572. This page was last modified on 14 May 2018, at 20:57.